This is the beginning of Canna Land. 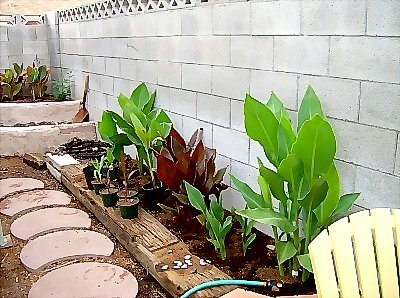 This bed has tall cannas so they can be seen over the above ground pool. Recently I added to the far end because I needed a place to grow some of my seedlings. Last year my son removed a row of messy bushes. It was so dusty and miserable on that side of the house. The goal was to cool it off and make it an inviting destination. Last fall I used this area as a nursery bed for canna starts and irises. This spring, vegetables were added. 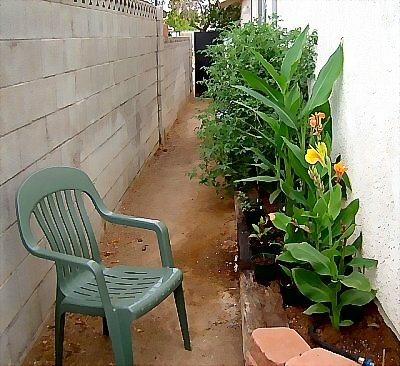 The tomato jungle you see behind the cannas is two Yellow Pear Tomato plants. I never saw any tomato grow like the Yellow Pear. It seems to be very disease resistant and able to outgrow tomato worms with minimal human help. It’s a tomato superhero! This entry was posted on Sunday, August 10th, 2008 at 9:40 pm	and is filed under Canna, Projects. You can follow any responses to this entry through the RSS 2.0 feed. You can leave a response, or trackback from your own site.